This is the report on one of the six projects forming part of the BirdLife Overberg conservation campaign on our coastline and estuaries, now being called the CleanMarine project. Like the "CleanMarine at BirdLife Overberg" Facebook page to receive regular news and updates on our projects. This is a report on progress made during April – the reports on the other five conservation projects are being published separately. We appeal to members, friends and partners to forward ideas and talk to us on how we can raise more funds and investigate possible donations to sustain these projects in the short, medium and long term. • Elaine and Helé decided to raise funds for basic expenses incurred with the coastal cleanup campaign. They will sell the WaddleOn Penguin socks for this purpose. These funds with be used to provide eats and drinks for the children participating in the cleanups. • Regular contact and collaboration is being maintained with the Recycle Swop Shop, the Onrus Litter Ladies and the Coastal Cleanup Conservation Trust. The “Oystercatcher Hero of the Month award” for April went to Antonio Da Silva-Swart of the Coastal Cleanup Conservation Trust. 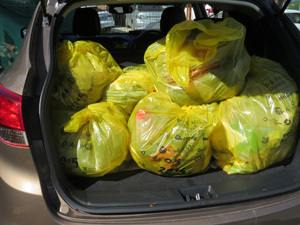 • More refuse bags were received from John Kieser of Plastics SA and we thank him for his support in this regard. It was also agreed that the monthly score sheets of litter collected will be forwarded to John, who will in turn forward it to the Oceans Conservancy in America. • The Onrus/ Vermont ward committee meeting was attended on 10 April and a meeting was held with Counsellor Jean Orban on 12 April. 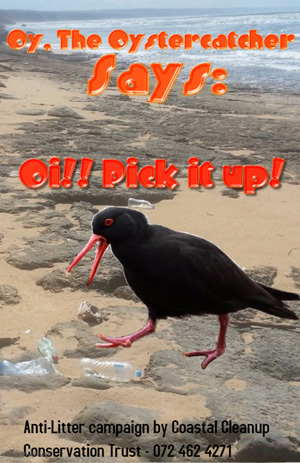 This related to a posting on the BirdLife Overberg Facebook page regarding the lack of regular refuse removal from refuse bins along our coastline. This problem was resolved and we now have direct access to an official at the municipality where we can report overflowing bins. 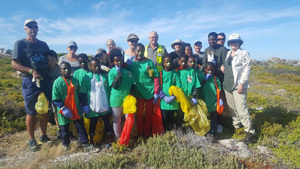 • Tarron Dry of the Environmental Management Division of the municipality is chairman of the Walker Bay Scuba Club and they regularly collect litter from the ocean floor. I undertook to investigate how the litter collected could be incorporated into the Oceans Conservancy statistics – this information will also be forwarded to John Kieser. We need to investigate ways of getting more members and other volunteers involved in these cleanups. Contact Elaine at mwjasser@mweb.co.za or Helé at birding@southernartceramics.com to become involved in this exciting project. 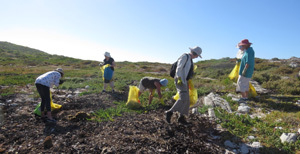 The next coastal cleanup will be on 12 May and will be done in collaboration with the children from the Recycle Swop Shop and the Milkwood Restaurant. It will take place at the Onrus beach. Details have been released under “events” on the BirdLife Overberg website. Can the west coast be added onto this project.